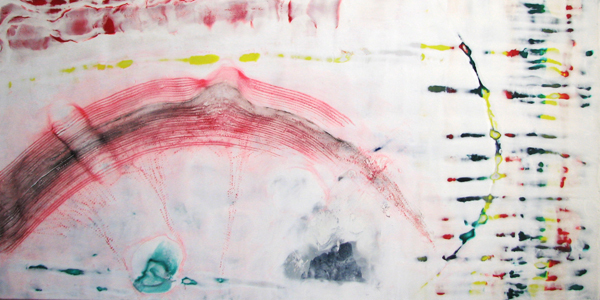 Sinopia is proud to introduce our October 2010 Artist of the Month: Michael Billie. 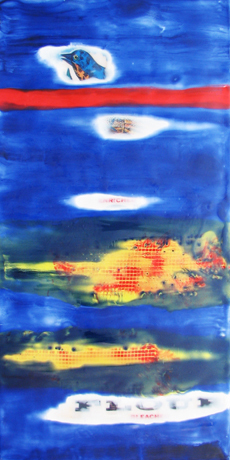 Michael Billie worked with metal plates to make art until a few years ago when he came across a wax painting in an art gallery. After doing a lot of research he learned about encaustics. 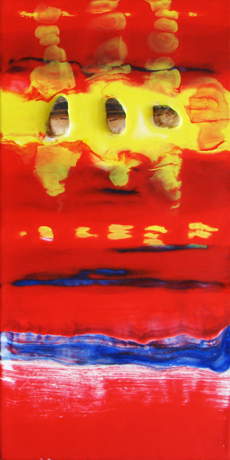 Encaustic painting is working with refined beeswax mixed with damar resin and pigments. The wax is tricky and full of surprises. His other love is photography and he's traveled to many interesting places in the world where he's collected images, pigments and other materials. He uses a lot of the collected materials into his body of work. Most of the colored wax that he works with he makes himself. He works with both a heat gun and a blow torch depending on the effect that he's looking for. He finds it very exciting that different pigment have their own personalities and they react differently when heated. 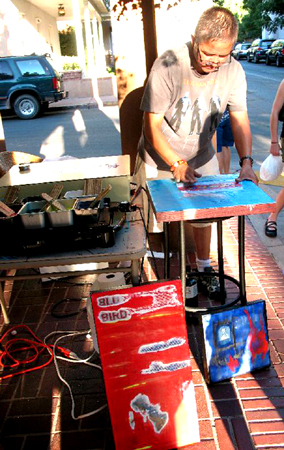 He' s done a few workshops in Santa Fe and another in Tuscon with the International Encaustic Artists Association. 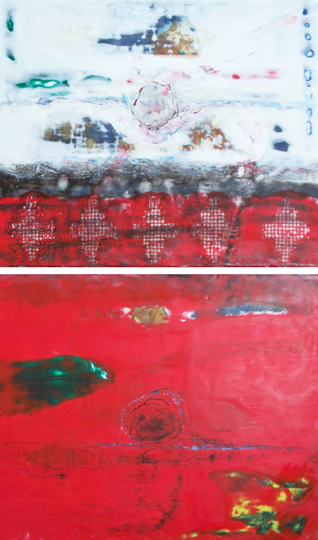 Michael is showing his work at the The Encaustic Art Institute in Cerrillos, NM and The FireGod Gallery in Santa Fe, NM. Michael Billie works in series of paintings. Every one of his series of paintings is devoted to a subject matter that is either from his Navajo culture or from trips he has taken around the world. the rocks from Petra, Jordan . . . . .
"A little girl was selling rocks to the tourist and I bought her whole inventory. When I first asked her how much for the whole tray she looked at me like I was crazy. After she figured I was serious she ran off to check on the price. She was grinning from ear to ear when she came back with the amount. I think I made her day." the Blue Bird flour . . . . .
"Blue Bird flour was always present in my childhood. After the flour was used up the colorful bag was recycled for many other uses around the house. The flour is the main ingredient for the famous frybread that everyone visiting the Southwest has to sample. When I was making the imprints for the grids it was like kneading dough." the sacred rock . . . . . "Shiprock is sacred to my tribe, the Navajos It's also called the Rock with Wings. This name comes from a myth that tells how the rock was once a great bird that transported the ancestral people of the Navajos to their lands. The Navajo ancestors had crossed a narrow sea far to the northwest (the Berring Strait) and were fleeing from a warlike tribe. Tribal shamans prayed to the great spirit for help. Suddenly the ground rose from beneath their feet to become an enormous bird. For an entire day and night the bird flew south, finally settling at sundown where Shiprock now stands." the school boy . . . . .
"The kid is a little school boy at his desk. The school was in rural Tibet and there are 10 students ranging in age in one small room which was the whole school. He was a little shy at first but came around after a few clicks of the camera. Kids and the elderly make great subjects."